Discussion in 'The Team Bus' started by Smudger, May 26, 2018. Wilmot is on at half-time with Udinese 1-0 down at the San Siro. Jumbolina and RookeryDad like this. Udi drawing a little clear of trouble. Jumbolina and The Voice of Reason like this. RD,you must be a bat or an owl! Good news? They ******* despise us. This week I am the forum’s correspondent in Orlando, Florida. Not visiting Disney but attending a trade convention. Fans of middle aged males with silver bouffant hair & tasseled loafers would be satisfied. I think you have misread the poster. In fact it says ‘WFC is the ****’, modern urban slang suggesting that, in the author’s opinion, Watford excel. How is the food in Orlando these days RD? I can’t speak for all food but went to a nice gastro pub type restaurant last night with my local friend. Hotel erred towards larger portions. Looks like little old lady with grey hair to me, is it Ben Wilmot's nan? 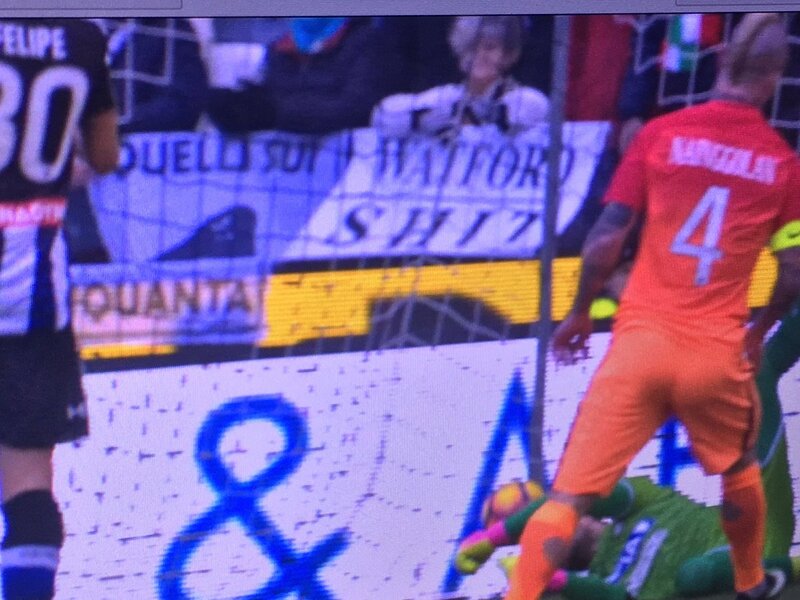 What about Watford, a pile of ****. I actually like the drawing of a turd mountain just in case someone doesn't know what **** is. It even has white bits, like the sun glistening off the turd as the sun rises over the horizon for another beautiful day. Or maybe undigestible pasta. I actually like the drawing of a turd mountain just in case someone doesn't know what **** is. .
Actually I'm not sure it ever looks like that. If it does, you should see a doctor. Looks more like a small compost heap. It falls into the semi solid what on earth did I eat last night range of ****. Typically the outcome of a kebab after a night out, where the kebab has sat on the rotating griddle for weeks getting reheated every night and cooling and being fly infested during the day. I hope Ben has proved a hit with the Italian ladies otherwise his stint in Udine will have been a complete waste. This move will have shattered his confidence. Not getting any minutes at all for an appalling side like that. It is a deliberate, spiteful act on their part. There's no doubt about it whatsoever. They send us dud after dud to weaken us, and destroy every player we send them. Yep . Team spirit is so good at the moment surely just being round the training ground would have been good for him. A baffling situation. Any way that Udinese can just cancel his loan and give him back .....or would he be prevented from playing for us and training with us ? The best is for him to train with @rsenal & hope to catch Javi’s instructions over the hedge. Better than training with his backing singers. Should be possible, he's U21 so wouldn't be counted against our squad count and doesn't need a work permit so would be allowed to train. Just depends on whether there was a clause in the contract between the clubs saying that the loan can be canceled. That being said it looks like he's the first backup at CB for Udinese, and I'm not convinced he'd be ahead of Kabasele, Britos, Cathcart or Mariappa here - so perhaps Udinese is still the best place for him at present? Plus there's the less measurable benefit he'll be gaining from being in a foreign country, learning a different style of football and culture and being out on loan far away from home. I'd even add learning how to deal with the disappointment of not being able to lark around on the pitch at Wembley with the rest of the fringe players last Sunday as something which, in the long run, players destined for the very top would use as a motivator to make sure they're there next time. In the starting lineup for Udinese at Lazio this evening. Half an hour in and Lazio leading 2-0 - Ben has had Udinese's only shot at goal so far. Code for being left to **** off every afternoon after training because he’s young, lonely & isolated?